Walk to a variety of shopping and dining from this spacious getaway. 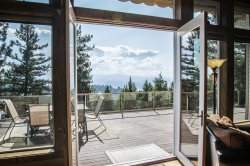 Village View Heights is a spacious, high-end condo in Riverstone—only 5 minutes from downtown Coeur d’Alene—with spectacular views of the mountains. Located above local favorite culinary lifestyle marketplace, The Culinary Stone, you’ll be only steps away from a myriad of other shops, restaurants, tasting rooms and a huge movie theater. This area of town eloquently mixes a trendy big city vibe with a friendly small town feel. Don’t miss taking a stroll around the man-made lake or hanging out at the park and playground where you’re sure to meet the local ducks. The condo itself is spacious, modern and features luxurious touches—including vaulted ceilings in the main living and dining space. This area has leather furniture, a large TV, a dining table with seating for 4 and access to the private patio. Overlooking Riverstone’s Main Street, this is a great place to sit and people watch over a cup of coffee or a glass of wine. Back inside, the fully stocked kitchen has stainless steel appliances, no shortage of meal prep space on the granite countertops and a high-top bar with seating for 4. If you’d like to grill outdoors, head over to the community’s large shared patio complete with a BBQ and seating. Just off the kitchen is the laundry room with a full-sized washer and dryer and a sink. This two bedroom, two bathroom condo’s master bedroom has a queen bed, TV and attached bathroom with double sinks and a beautiful glass door shower. The second bedroom has a queen bed and two sleeper sofas—one queen and one twin—for additional guests. A shower/tub combo can be found in the second spacious full bathroom. You’ll be thrilled with the amenities and nearby local businesses when you vacation at this stunning downtown Coeur d’Alene condo. Very friendly and easy to work with. It was very easy to rent and pay for this house. The property was beautiful and really much better than I expected. Great condo. Wonderful accommodations. Very clean and well stocked. Great location.